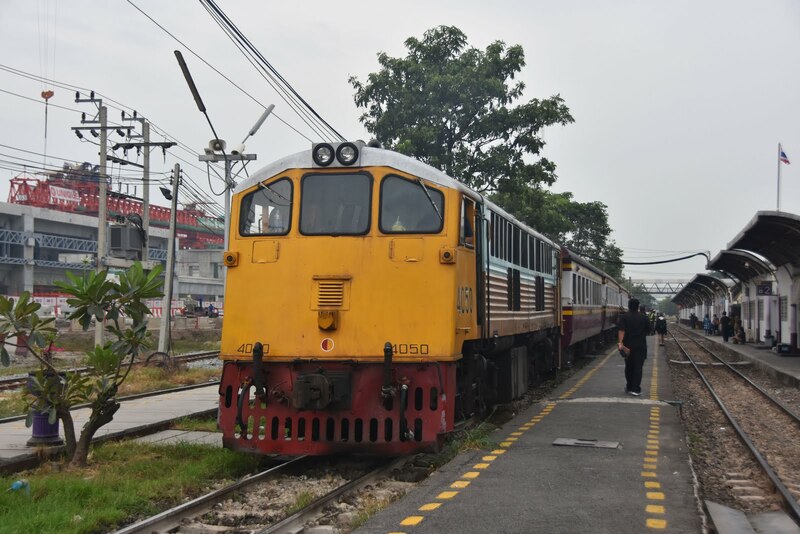 4013, my first 'Shovel' GE UM12C shunts stock outside Bangkok's Hua Lampong station. UK spec Desiros on the Suvarnabhumi Airport Link. A very brief visit on my way to New Zealand saw me touch down with Thai Airways at Suvarnabhumi Airport around 06:30. My cunning plan to avoid jet lag by flying half way around the world straight off a night shift appeared to be paying dividends as I had had a good sleep on the plane and felt quite awake. It was a little struggle to get into Thailand as the queues at immigration were quite lengthy- anyway, nothing to do other than stand in line. 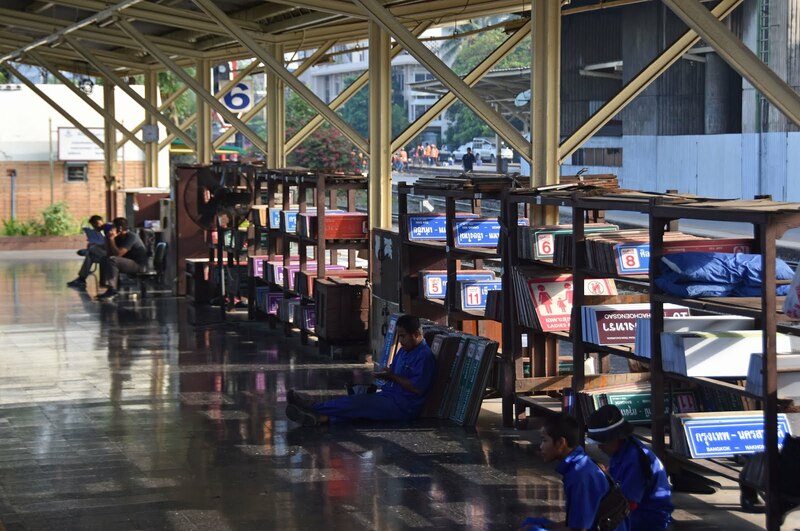 Once stamped into Thailand it was a simple process to transfer to the airport rail link to the city. Having arrived into Waterloo the previous day on a class 450 it was somewhat sureal (even if expected from my research) to find myself on another UK spec Desiro on the airport link! 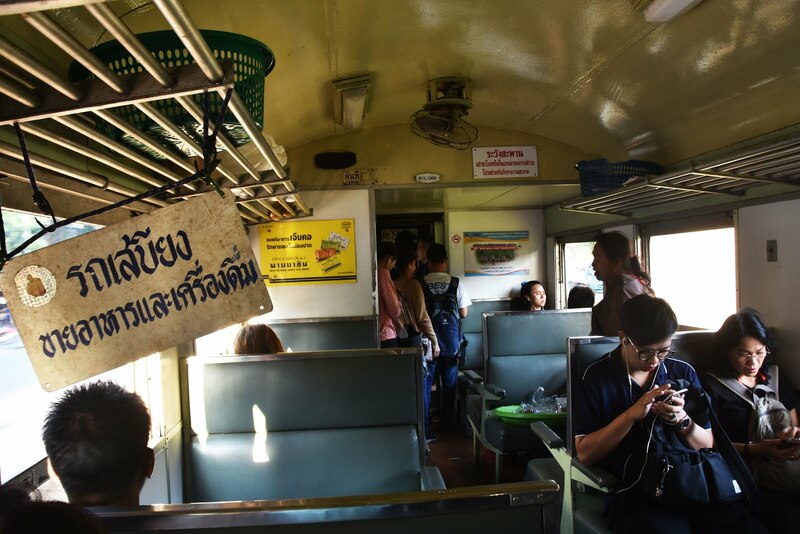 3rd Class on board an 'Ordinary' Thai train. The crossing 'closed' 4402 cautiously approaches Asok. 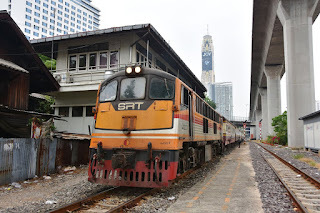 I didn't continue the whole way through to central Bangkok as, having checked the train times online there should have been a connection onto a train on the conventional network at Asok. The Eastern Railway follows the air link for most of it's route however I chose to change here as I could also use the subway to reach my destination if the train didn't materialise. As soon as I hit street level I got my first experience of the full-on nature of Thailand. The place is bonkers with all sorts of transport pretty much everywhere and beneath the pillars of the modern airport rail link was the single meter gauge track of the Eastern Railway - no fences and in some places squeezed right next to buildings. The station was easy to find, though there was nobody else waiting- a look at the departure board confirmed the train time that I had checked online so I made my way to the only building on the station, the crossing keepers cabin to attempt to buy a ticket. I couldn't, but I was directed to the correct platform for the train, and only a few minutes after the scheduled time the road barriers were lowered, the traffic did not stop, and with a green flag from the crossing keeper the train hauled by Alsthom A24C 4402 cautiously approached. As I had been expecting a DMU the loco hauled train was a pleasant surprise and I jumped on through one of the open doors. 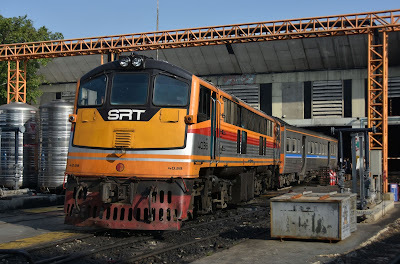 The train was well loaded, but not full and very soon a member of staff ushered me to a seat and sold me a ticket to Bangkok's main station- Hua Lampong for the princely sum of 2 bhat (around 4p). 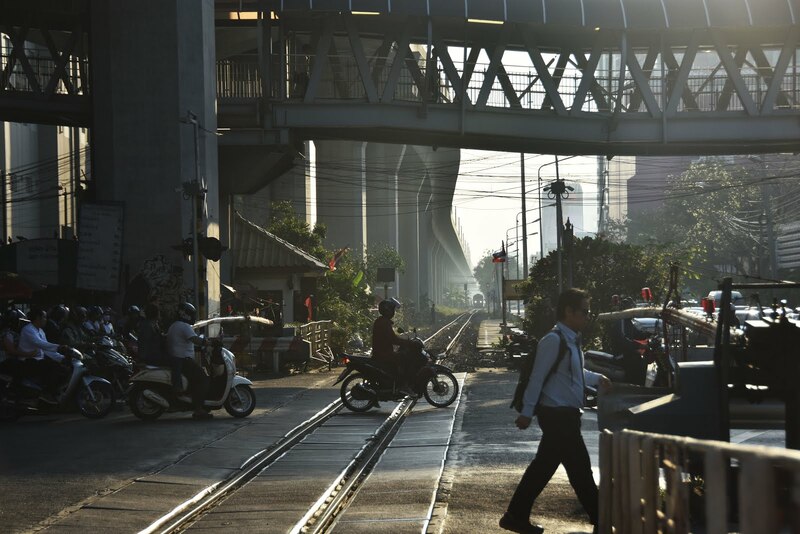 Of course I was quite happy to stand and lean out of a window, or a door, and take in the streets of Bangkok as well as the quite rateable traction. 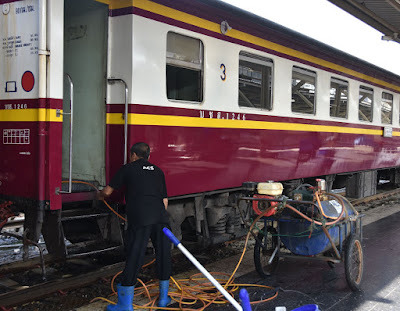 Carriage Cleaning at Hua Lampong. 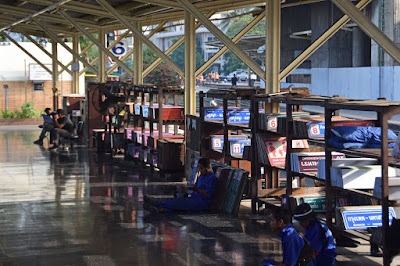 Destination boards wait their trains at Hua Lampong. Life by the lineside -No palisade fences here! The journey into Hua Lampong could only have been a few miles but took some 40 minutes, our progress being very slow- particularly at road crossings where it could take anything up to a few minutes to clear the road for our passage. There was a further delay outside Hua Lampong where quite a few passengers just got off onto the track anyway. Approaching the station I got my first glimpse of the locos that were top of my list for this country- the fairly ancient 1963-66 built General Electric UM12C -or as the enthusiast like to call them 'Shovel Noses'. 4013 in the older livery (which I though may have all disappeared) was shunting the station and instantly I could see, and hear, the attraction of these machines! The plan of was to head straight to my hotel, drop off my bag, be a tourist for a bit and come back a to the station a little later. Of course this isn't what I did. There was a 'Shovel' shunting around, the sun was out and I had already discovered what a wonderful little rail system this was to explore. I talked my way over to the depot at the end of the station where another 'Shovel' 4038 was shunting and also got my first and only glimpse of one of the SRT 'Sprinter' units- a tag on to the BREL class 158 order at York and originally delivered in Regional Railway Express livery as nothing else had been specified! inward opening slam doors, minus gangways and on narrow gauge! 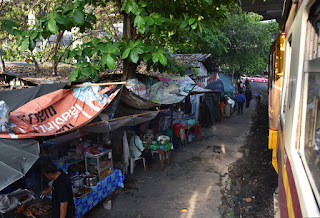 I had no issue with photography at Hua Lampong (except for the difficulty with light and dark under the main trainshed) until I upset a member of staff for straying too far down the platform. I suspect he didn't like my camera as there were plenty of other people all over the track - I would now be hounded for the next 2 days by this one uniformed staff member! 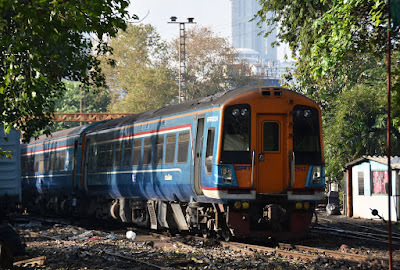 Hua Lampong is a fascinating place to spend a few hours with a multitude of morning loco-hauled arrivals interspersed with a few DMU's. Most trains are then shunt released and there was plenty of work to keep 4013 busy taking coaching stock to and from the yard and adding and subtracting coaches from the various trains that were coming and going from the station. The shunters were very prompt and despite considering it many times I never did manage to 'accidentally' get on any of the trains which were being shunted in order to score 4013. There is plenty of life on the platforms aside from the trains; the team who change the destination boards on the train sides to the staff wandering the platform with carts with engines on who's role seems to be to clean the trains. Elsewhere there is another platform with a large store of brake blocks presumably for carrying out necessary repairs to the stock while it lays over. While 4013 kept tempting me by sitting on trains approaching their departure time it was 4050 that would be my first sighting of a 'Shovel' working a train when it arrived with train 342 from Kaeng Khoi Junction. Finally it was time for me to leave station and head into the city to see some sights - I would be back later for my 'Shovel' ride. 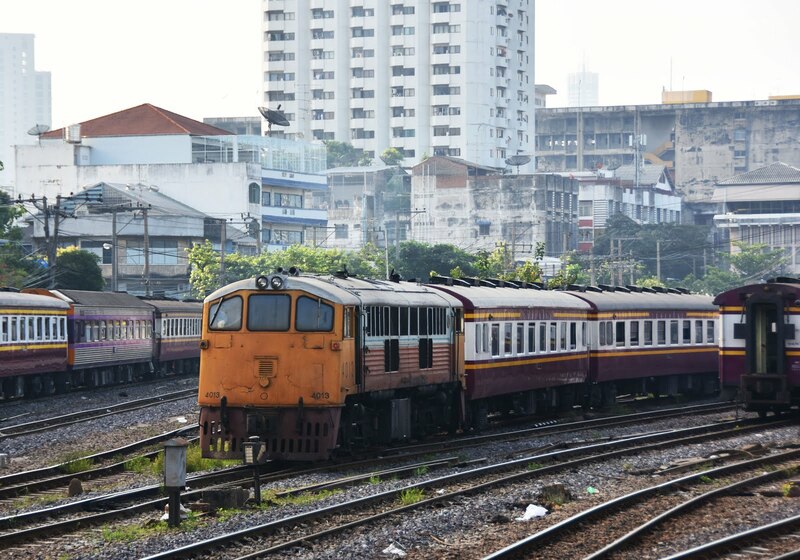 Alsthom AD24C 4420 arrives into Bangkog during the morning rush. are the last in Bangkok but are no longer functional. Having taken my first trip on the Chao Prahya River (with boats at least as bonkers as the trains), wandered around the Grand Palace and found myself some street food for lunch I made my way across the river to Thon Buri station- a much smaller terminus in the west of the city. I knew I had missed the 13:05 departure, which according to the gen I had seen is a good bet for a 'Shovel', but this still left the 13:55, which I also believed should be a good bet. 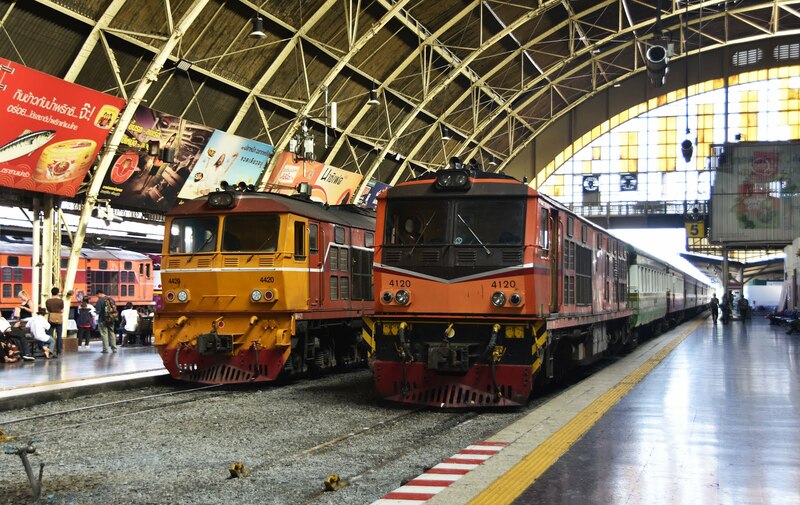 I had a little time so went to explore the depot which is home to Thailand's collection of steam locomotives as well as several diesels undergoing maintenance. 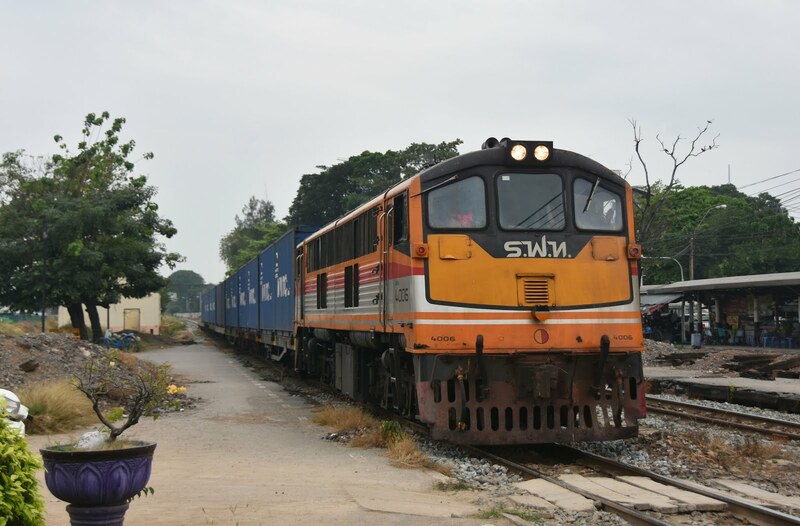 'Shovel' 4006 hauls a container train through Bang Sue. 4025 assist with afternoon shunting at Hua Lampong station, Bangkok. 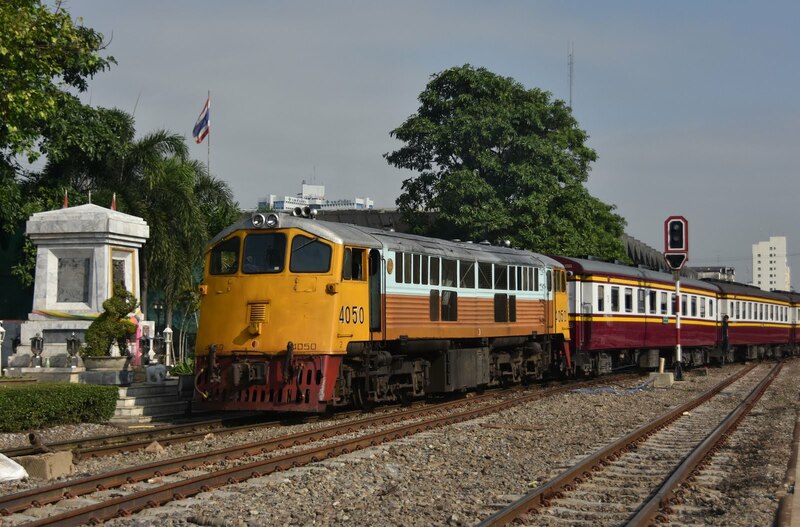 Back at the station 4413 and 4005 had appeared in multiple to work the 13:55 to Nam Tok. I bumped into another fellow with a camera at Thon Buri, and was pleased to chat to Colin, a loco driver form Australia. We both brought our tickets to Taling Chan Junction for 100 bhat (I never quite worked out why this train was so expensive compared to those out of Hua Lampong) and enjoyed the short journey - not much noise from the 'Shovel' unfortunately, though it was turned on. 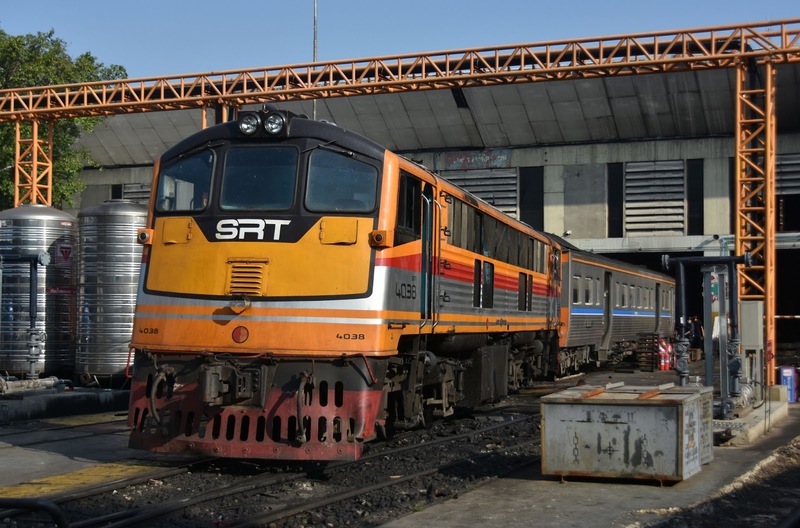 We hadn't checked the onward connection from Taling Chan back to Bangkok and it therefore wasn't a huge surprise that there was no train for several hours. A taxi was coaxed into taking us to Bang Sue and was no trouble once we had persuaded him where we were going with a little help from Google Translate. 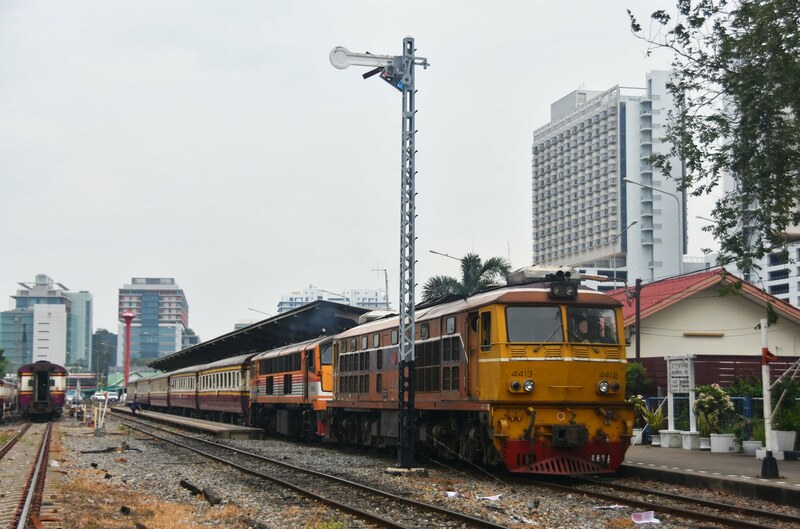 I left Colin here to play on the SkyTrain while I hoped for a loco hauled connection back to Hua Lampong. It wasn't to be as there is clearly a dirth of trains at off-peak times. Instead I took the full length of the metro which featured a couple of Mormon's, some American tourists and an old lady with nasal sticks up both her nostrils who was lying on the floor (A kind Thai gentleman walked her home cementing my view of the Thai's as some of the friendliest people around). on the new Bang Sue station can be seen to the left. 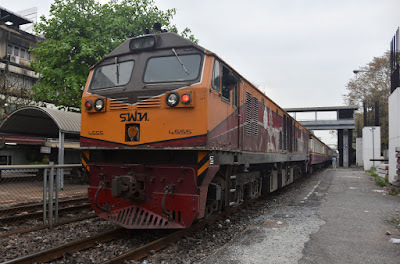 Back at Hua Lampong I had a couple of trains in mind for my 'Shovel' ride from the various trip reports that had appeared on World Rail Gen- 277 the 15:25 to Kabin Buri and 341 the 17:00 to Kaeng Khoi Junction seeming to be the most likely candidates. My metro ride had caused me to miss 277, however 341 did the trick and 4050 backed onto the train and armed with my 2 bhat ticket I took my seat (after my security friend from earlier had tried to shoo me away!). 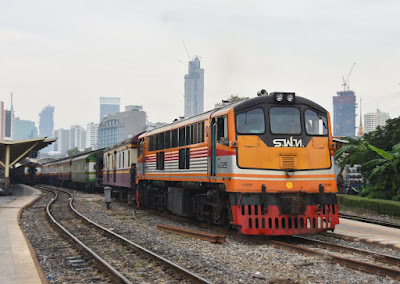 The run to Bang Sue Junction was most enjoyable, 4050 providing great entertainment with plenty of station stops and many crossings where the train once again had to pause to wait for traffic to clear. The train moved at a decent speed but it was still staggering how long it took to cover the small distance to Bang Sue. 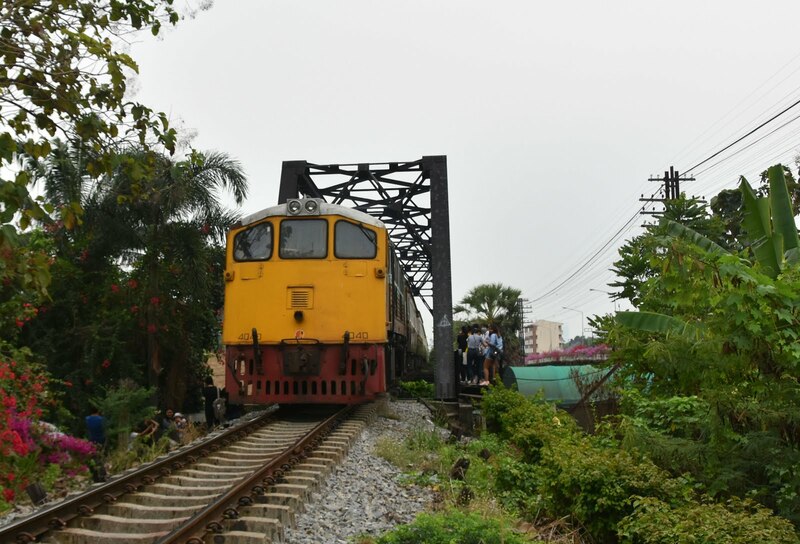 This stretch of track along with the main station at Hua Lampong is due to close in 2019 to be replaced by a new huge new station currently under construction at Bang Sue. 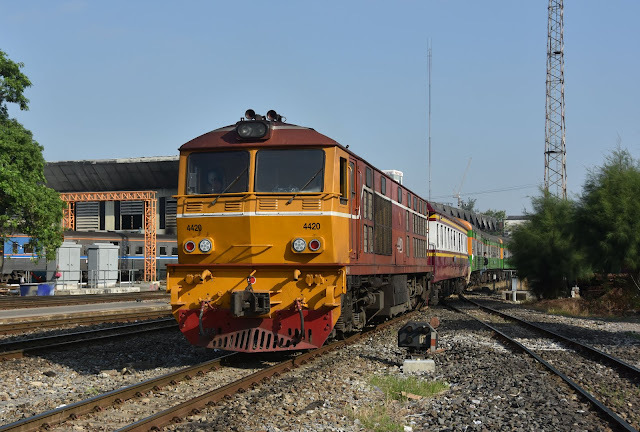 GE CM22-7 4555 pauses on the run in to Hua Lampong. A quick connection was available back into the city, this time with GE CM22 4555 which also made a rateble bit of noise. With darkness falling it was time to call it a day for trains and head back out to the city. Bangkok's Hua Lampong terminal in the city centre is due to close permanently in 2019 with trains terminating at the new Bang Sue station. The old station is planned to be converted to a railway museum. Alsthom 4123 has arrived with a passenger train as night falls on the city. 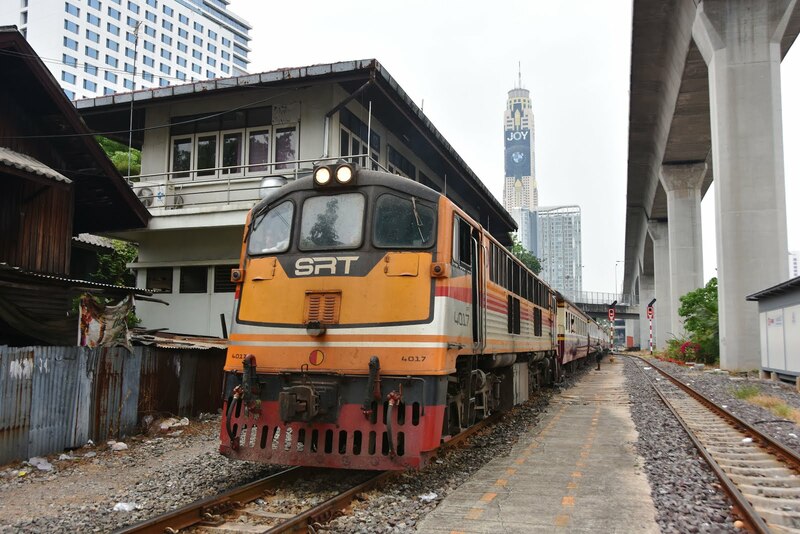 13:05 departure from Thon Buri. This wasn't really a day for trains, but of course a few managed to creep into the schedule. My morning entertainment was to visit the floating market at Taling Chan which is adjacent to the railway out of Thon Buri. A number of trains were seen but generally I managed to be in the wrong place at the wrong time, eventually managing to get into position for 251 the 13:05 departure from Thon Buri. This produced 'Shovel' 4040 - with the weather being fairly gloomy it possibly wasn't worth the wait, especially as it now left me very tight to make my train back to the airport. to Kabin Buri. The airport express line towers above. A boat ride back to my hotel in the Chinatown district and a hurriedly hailed Tuk-Tuk was just about quick enough for me to reach Hua Lampong for the 15:25 departure. 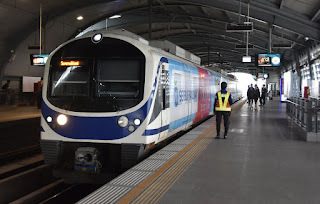 I had intended to take the metro and Airport Rail Link back to the airport, however a quick check of the train schedules showed a train at almost the perfect time from Hua Lampong to Lat Krabang (the last station where one can connect onto the Airport Rail Link off the Eastern line), better still it turned out to my delight that the train in question was 277, one of the two I had down as a very good bet for a 'Shovel' - it was and 4017 was a great way to finish my short trip to this fantastic country. The train was packed and I spent much of it hanging out of a door - certainly a contrast would be felt when I moved from the 'old' station at Lat Krabang up into the concrete sky to board the airport Desiro. And thus my fleeting visit to Bangkok was at it's conclusion. Thanks to the gen providers and particularly those who have posted their reports to World Rail Gen.
'Shovel' 4050 in the original colour scheme arrives into Bangkok Hua Lampong with train 342 from Kaeng Khoi Junction.